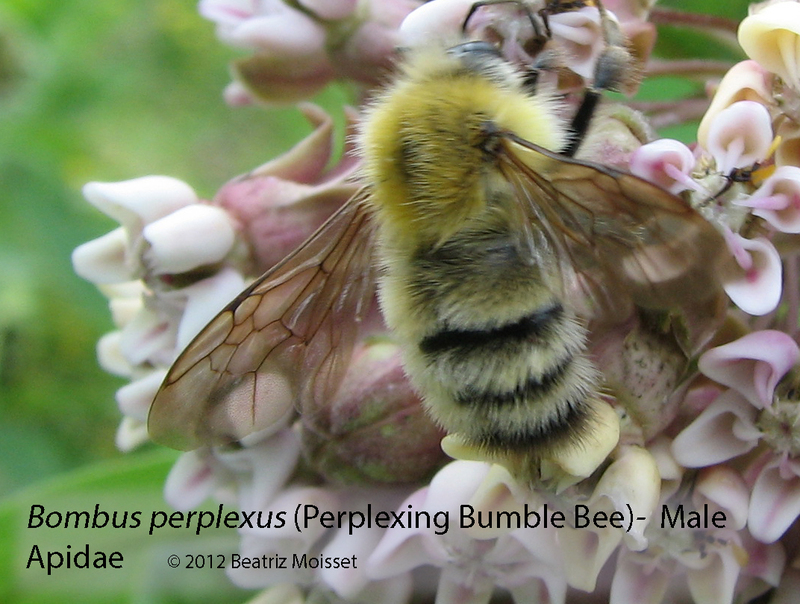 Wherever a proper balance exists between plants and pollinating insects, both flourish. Agricultural development, however, has seriously interfered with this balance. It has demanded the growing of certain plants in enormous acreages and has unwittingly destroyed native pollinating insects as well as their nesting places. As a result the burden of pollination has been increased to such an extent that wild bees are no longer adequate or dependable. . . In many places the depletion of wild pollinators is so acute that honeybees have to be brought in especially for pollination, and so in practically all agricultural areas honeybees are now the most numerous of the flower-visiting insects. When the sun goes down and flowers fold their petals for the day pollinators pack their bags and go to sleep. A new set of flowers steps in after sunset and a new array of customers takes to the air in search of nectar and pollen: the night shift. 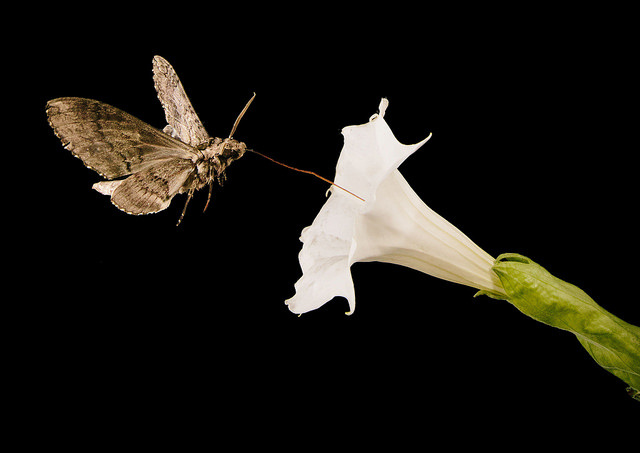 The flowers that attract nocturnal pollinators don’t need flashy colors. They are white or pale colored instead, easier to be seen in the dark. They produce strong aromas that appeal to their visitors’ keen sense of smell. 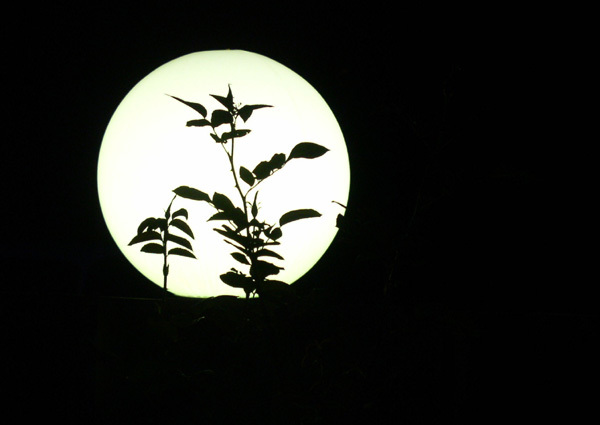 Nocturnal creatures such as moths and bats and a few exceptional bees are among the night flower visitors. Very few flowers bloom in the dead of night. More often they open at dawn or dusk, when twilight makes the job of their pollinators a little easier. Think of morning glories, moon flowers, 5 o’clock blossoms or evening primroses. If you have some of these in your garden you may be fortunate enough to see their guests. 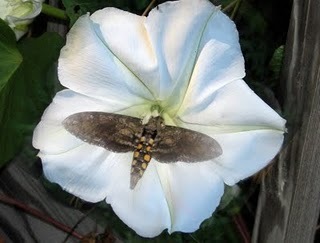 A very striking visitor of many evening blooms is a large moth, the pink-spotted hawk moth. It bears an elegant muted pattern of cream and dark brown, highlighted by pink spots along its sides and on its wings. It arrives silently at its goal after sunset, unfolds its long tongue and sips nectar while suspended in air like a hummingbird. The next evening it will appear once again at the appointed time and collect its reward from the open blossoms. You can observe it almost daily as long as the flowers keep blooming. Some people fear and hate moths even more than they hate other insects. There are even those who consider them messengers of death. This is unfortunate. I wish that they could overcome their unfounded fears enough to appreciate these moths’ graceful beauty and their role in the garden as the partners of evening bloomers. An illustrated beginner’s field guide to insect flower visitors, including pollinators. The guide provides concise descriptions, photos and life history information of the most common insects found visiting flowers. It includes time of year, geographic area and favorite flowers. 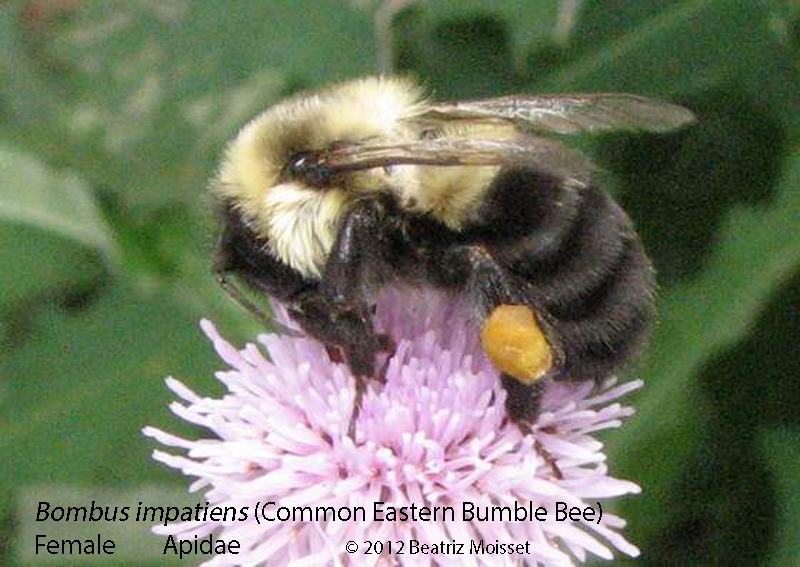 Also mentioned are those that act as pollinators and whether they may sting. 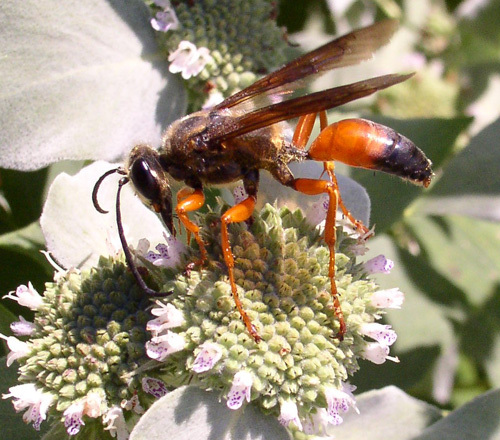 Paper wasps or paper nest wasps are large and noticeable, long legged, brown, reddish or nearly black with yellow markings not as pronounced as those of hornets and yellowjackets. Like them, they fold their wings lengthwise when not flying. They build their nests, attached by a stalk to a surface, with paper made by scraping plant fibers, softening them with saliva and chewing them up. These nests are considerably smaller than those of hornets and yellow jackets. 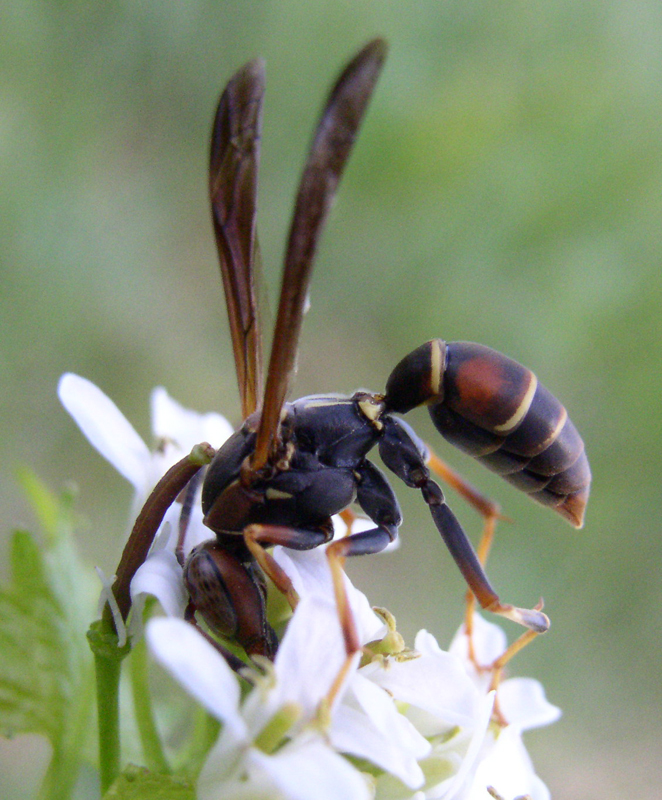 The Northern Paper Wasp is brown or nearly black, with distinctive large round spots on the sides of the abdomen in addition to the other markings. 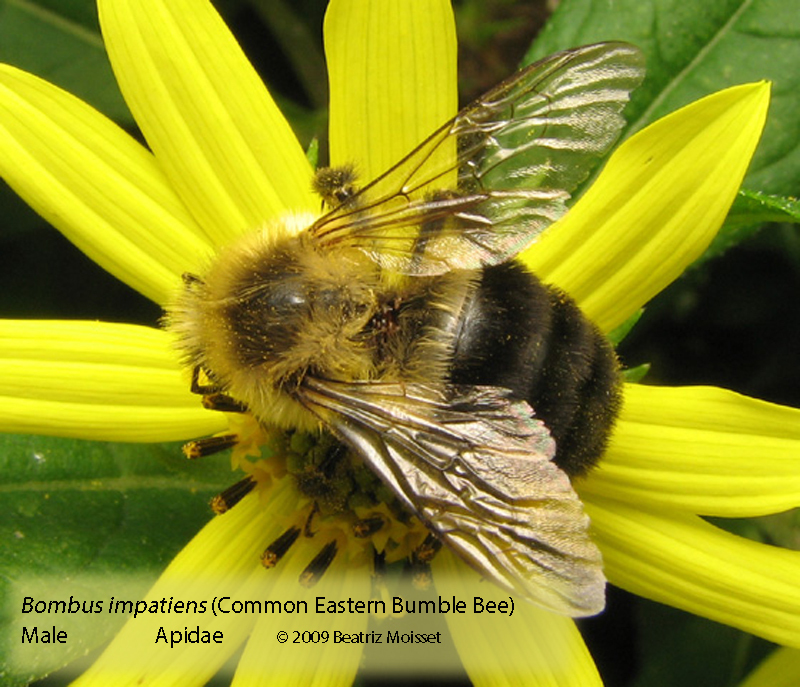 It is found in eastern and central North America but not in the west. 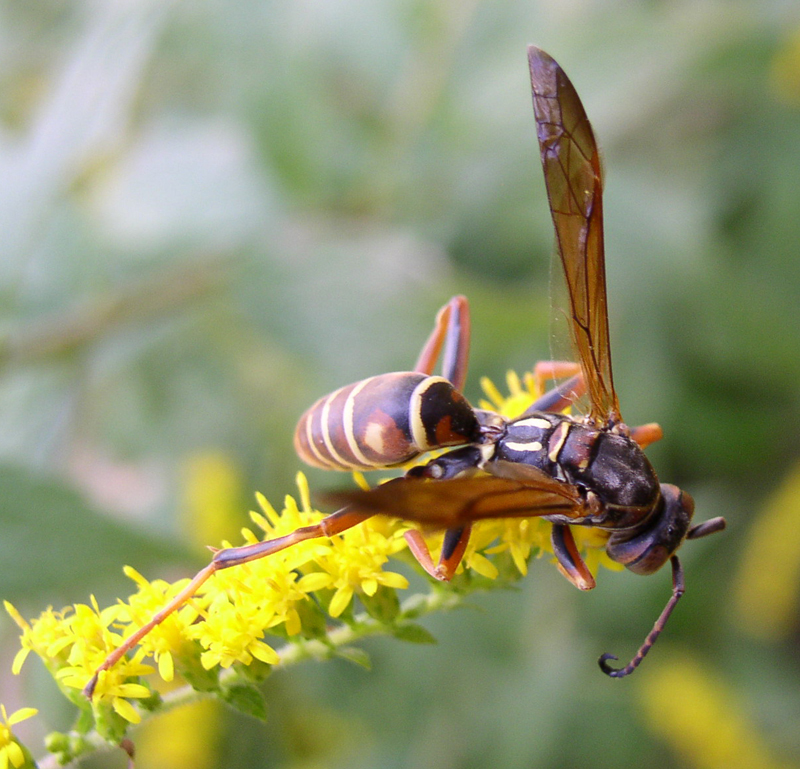 An introduced species, the European Paper Wasp, has become common and widespread throughout the continent. 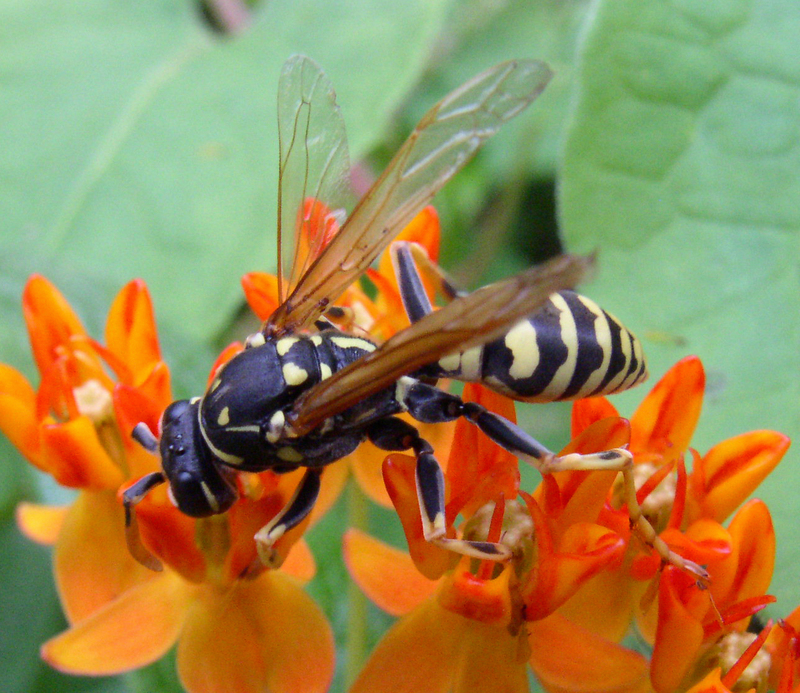 It presents a stronger pattern than that of the Northern Paper Wasp, mostly black with contrasting white or pale yellow markings. 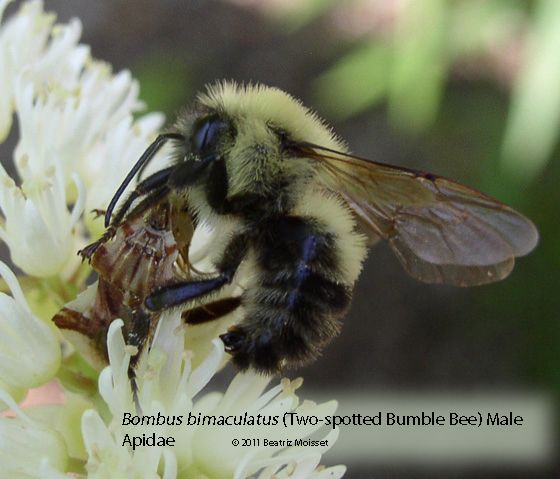 Both species visit flowers frequently to drink nectar and may do some pollination. They hunt insects which they feed to their young. 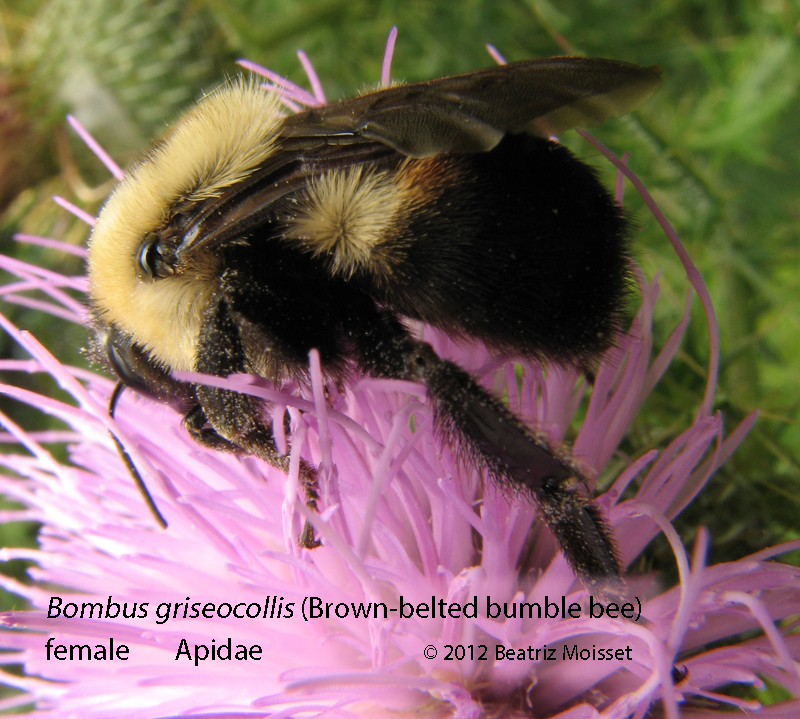 Habitat: Fields, meadows, forested areas. Season: March to November, year round in southern states. Most frequent between July and September. Flowers: milkweed, Queen Anne’s Lace, many members of the aster family like snakeroot, tansy and goldenrod. 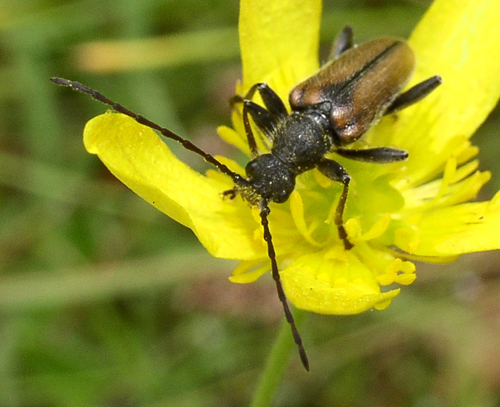 Longhorn beetles get their name because of their thin and long antennae, usually as long as their bodies or even longer. 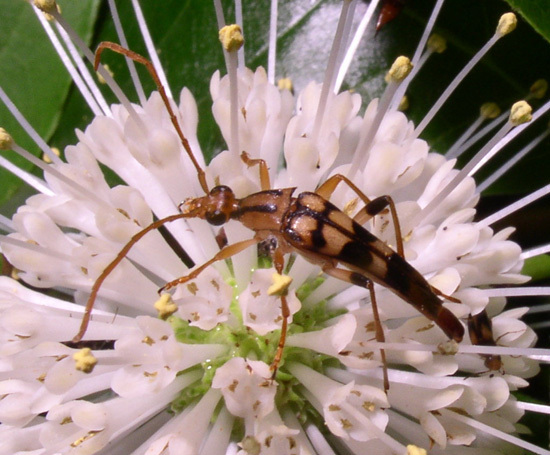 Among them there is a group often found on flowers, the flower longhorns. One interesting characteristic of flower longhorns is that they are all very slender, almost tubular shaped. 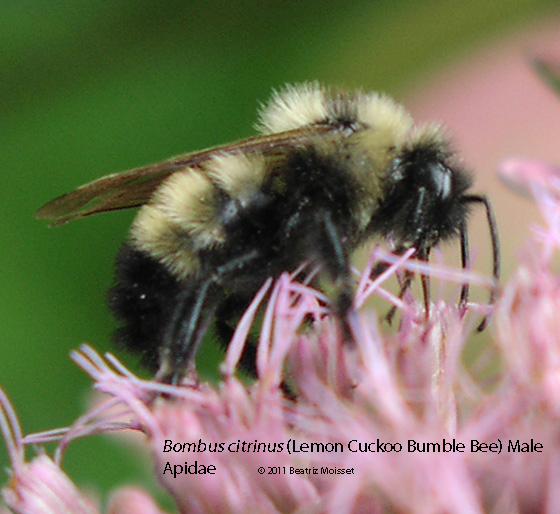 Adults feed primarily on pollen and nectar; that is why they frequent flowers. They are mid sized beetles between 1/2 and 3/4″ in length, not including the antennae. The Yellow-horn Strangalia is among the thinnest ones. 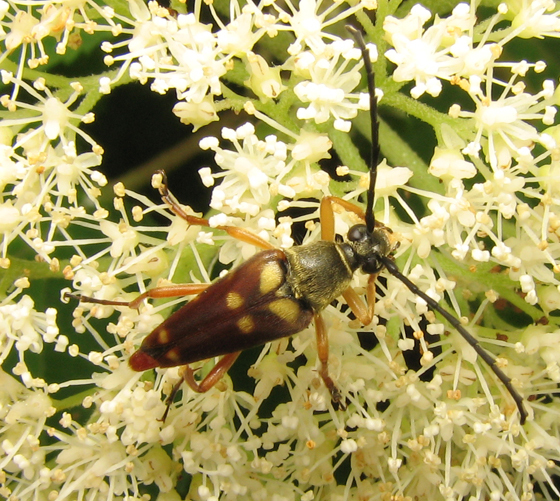 Its long antennae are yellow, and they have a pattern of dots or marks on the wings. Found in the eastern states. 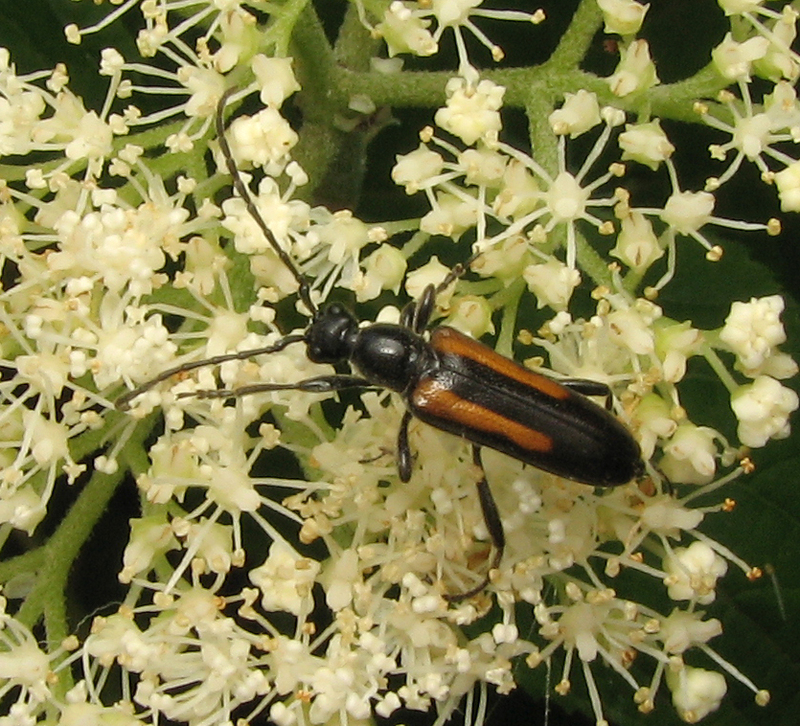 Strangalepta abbreviata is stouter, black with orange lengthwise stripes. There is great variation of markings: some are all black or almost all orange. Eastern and central states only. Cortodera is similar to Strangalepta abbreviata but it is found only in the West. The Banded Longhorn has a pattern similar to that of the Yellow-horn but it is easy to tell apart because of its stouter shape. It is still leaner than most beetles one is familiar with. Rich brown color with yellow-orange cross bands Sometimes the bands are reduced to spots. Eastern and central states only. Habitat: Fields, openings, with flowers, adjacent to woodlands. 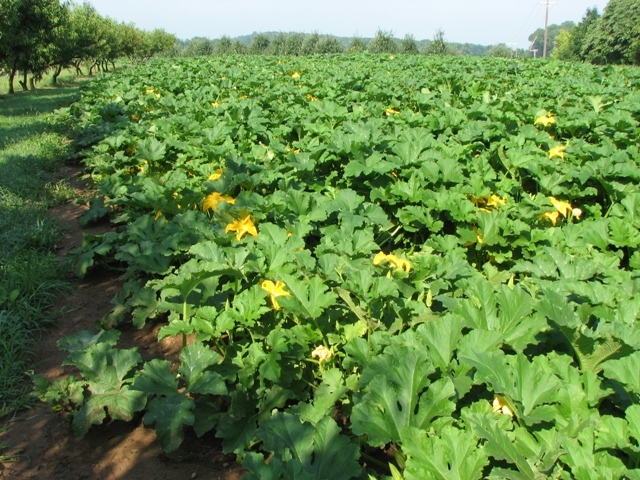 Season: From May to August, most abundant in June and July. Flowers: Flowers of the carrot family, rose family, aster family. The Banded Longhorn has a special preference for Echinacea. 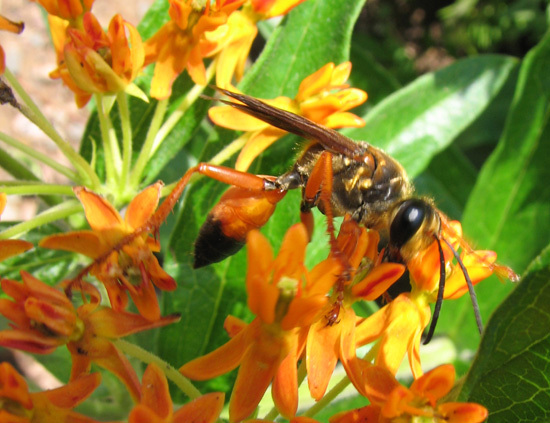 Another thread-waisted wasp is the very impressive Great Golden Digger Wasp. With its large size of up to an inch and its striking colors, it catches the observer’s eye. 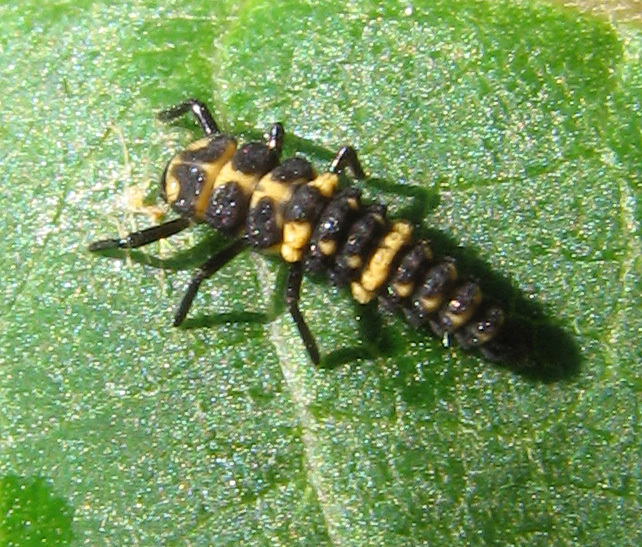 Its black head and thorax are covered by golden hairs. The first half of the abdomen and the legs are bright orange and the end of the abdomen is black. It feeds on nectar and sometimes it is hard to observe because it is very active and moves quickly from flower to flower. There is little to fear from this wasp, despite its impressive size, because it is not prone to stinging. It builds its nest underground and stocks it with insects, such as crickets, grasshoppers and katydids, to feed its brood. It is a valuable pest control. 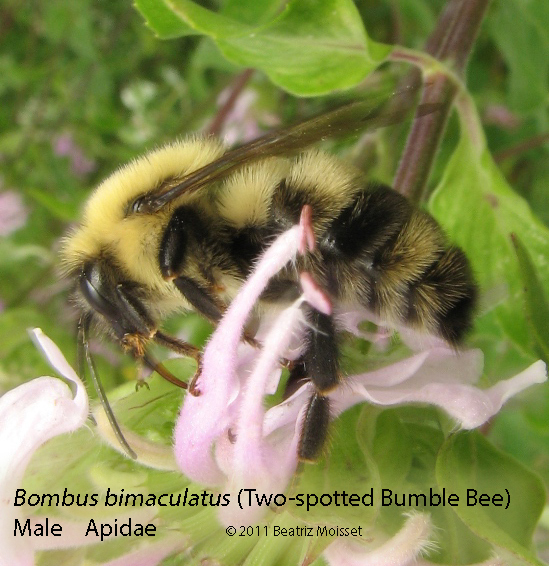 Habitat: Fields, meadows, with sandy areas nearby. It is found throughout North America and reaches Central America and part of South America. Season: From June to October in most of North America. Most common in July and August. Can be seen as early as April in Florida. Flowers: It likes flowers grouped in clusters, like milkweeds, mints, goldenrods. It also visits many others, like asters and sedum. 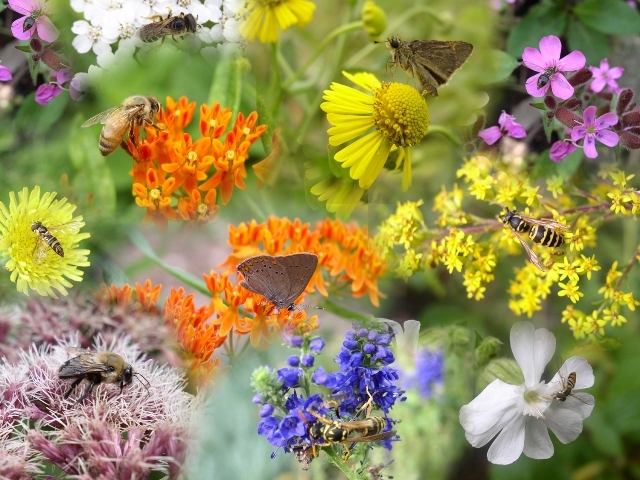 Flowers are visited by a great variety of insects, and some spiders too. Some of these insect visitors are very beneficial to the flower. 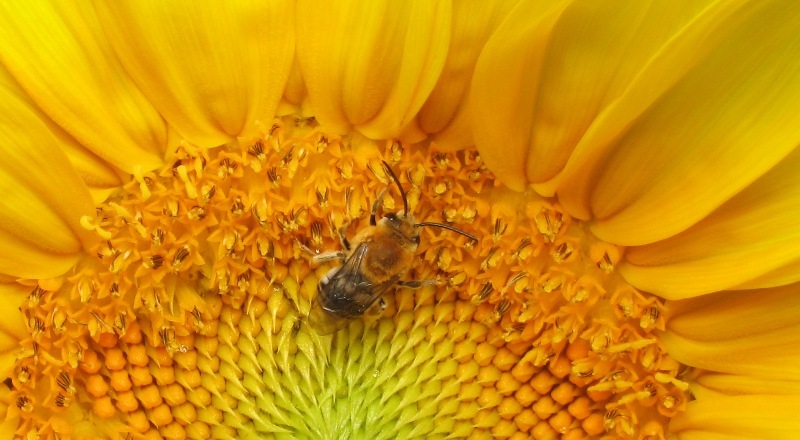 They carry pollen from flower to flower performing pollination. This is what the plant needs to make seeds and thus make new plants and new flowers. The list of flower visitors is extremely long and some of the insects are impossible to tell apart by sight only, so this guide doesn’t attempt to cover them all. I will just merely highlight some of the most common flower visitors, in particular those that pollinate flowers. You will be able to recognize some of them or, at least, you will know what group they belong to. 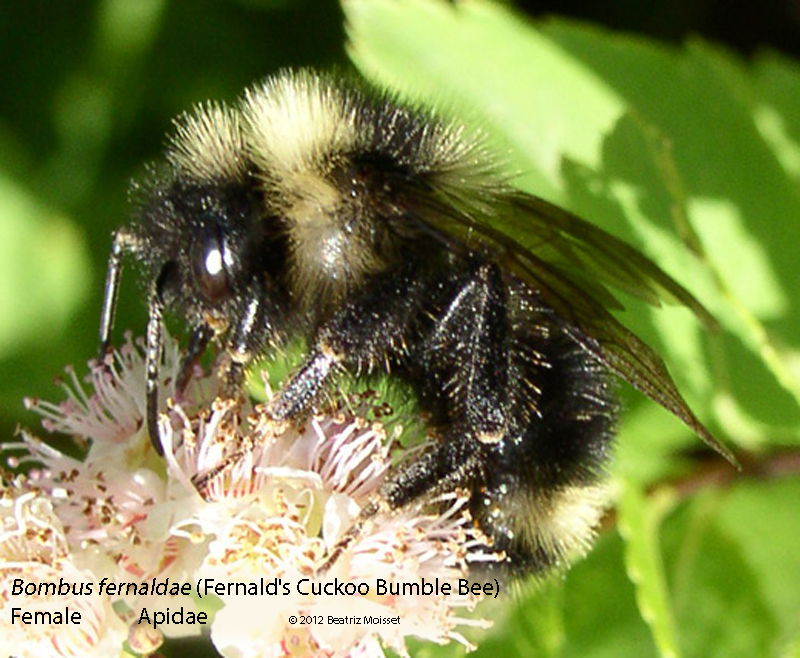 What do pollinators look like? 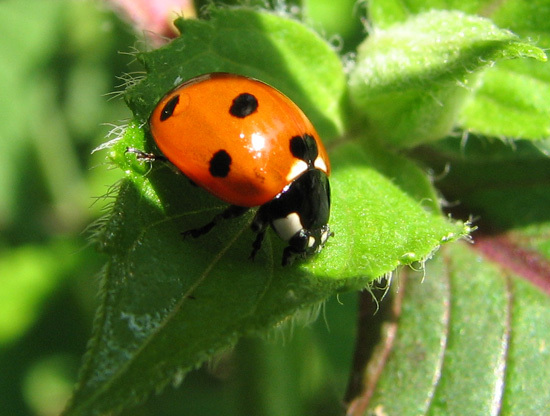 Lady bugs have gained the affection of grownups and children alike. These colorful beetles go by other names such as lady beetles, or even ladybird beetles. Probably the most accurate one is lady beetle since it is a beetle, not a bug. 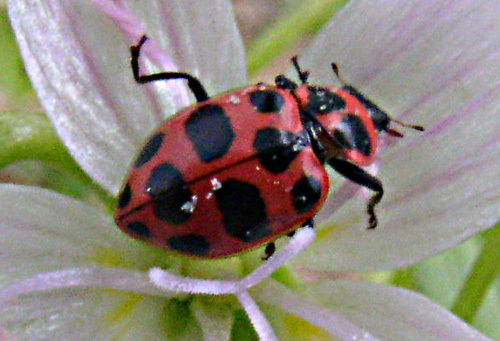 There are different kinds of lady beetles; most are brightly colored with a pattern of red with black spots, such as the Seven-spotted Lady Beetle; in a few this pattern is reversed. Others have some orange or yellow instead of red. There are even a few that lack spots altogether, like the Polished Lady Beetle, or that are mostly black. 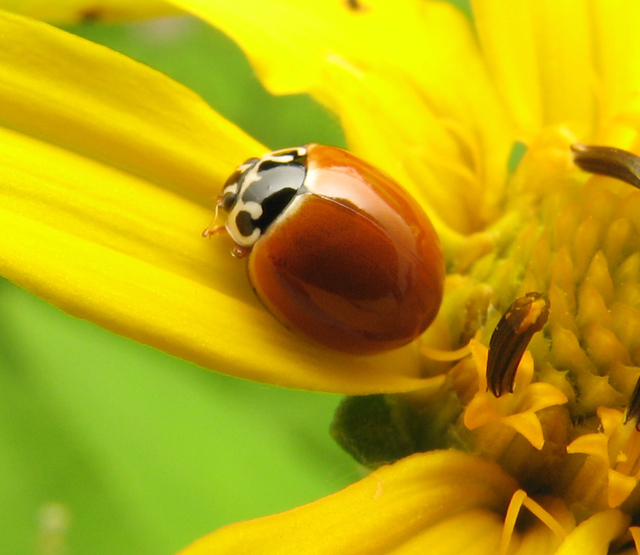 They are fairly roundish, although a few have an oval shape, like the Spotted Lady Beetle. The smallest ones are about 0.04 in but the most familiar ones are larger, around 0.3 to 0.4 in. Their babies or larvae don’t look like the adults at all. They look more like little alligators. They are rarely found on flowers because most of the time they stay on foliage or stems eating their favorite food, aphids. 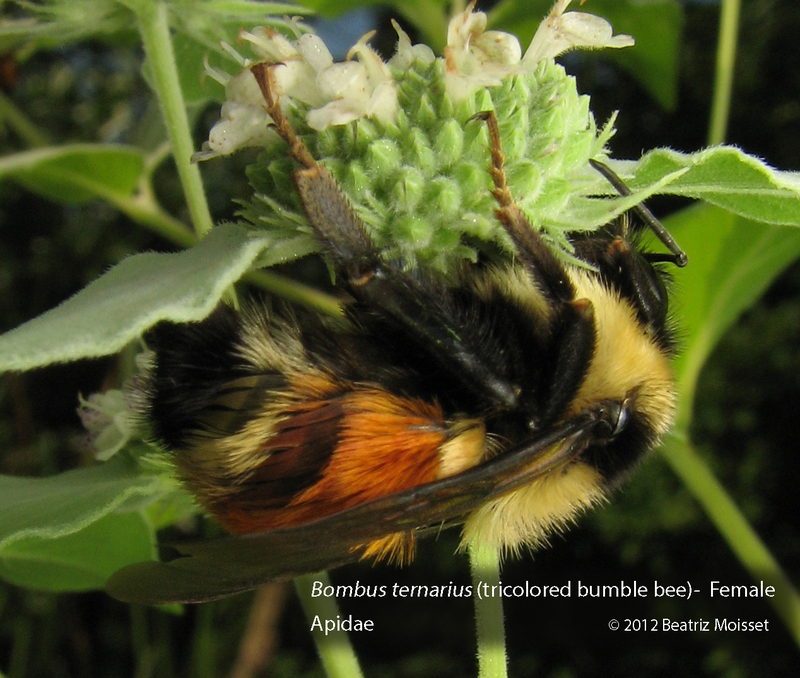 Although they don’t distinguish themselves for being good pollinators, they are prized by gardeners because of their role as pest controls. They are voracious eaters of aphids and other soft bodied garden pests. Habitat: Gardens, fields, anywhere that aphids abound. Season: Year round in southern states, from March to October and even November in the rest of the country. Flowers: They are more likely to be found on foliage than on flowers, but they do visit many different kinds of them. You are currently browsing the archives for the pollinator category.